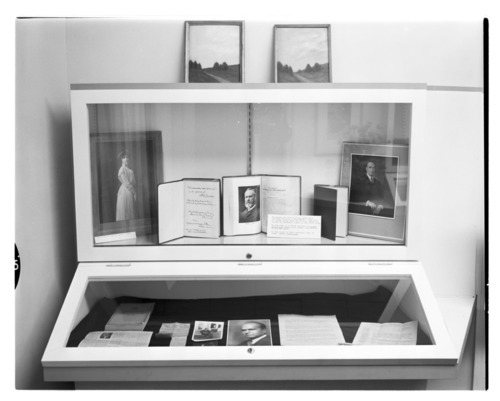 These six black and white photographs show the exhibit about the life and work of Clifford W. Beers, a mental health pioneer. The exhibit opened October 4, 1963, in conjunction with the annual meeting of the Board of Menninger Trustees. In 1909 Beers founded the "National Committee for Mental Hygiene", which became Mental Health America, in order to continue the reform for the treatment of the mentally ill. He also started the Clifford Beers Clinic in New Haven, Connecticut, in 1913, which is believed to be the first outpatient mental health clinic in the United States. He was a leader in the field until his retirement in 1939.